(From left to right) Tatiauna Holland of the Holland Law Firm, PLLC, Sam Milledge of the Milledge Law Firm, PLLC, Tonya Jones, Harris County Criminal Court 15 Candidate, and Attorney Jasmine Henderson at Conversation With the Candidate: Legal Seminar & Town Hall on February 17, 2018. Managing Attorney Tatiauna Holland of the Holland Law Firm, PLLC was a guest speaker at "Conversation with the Candidate: Legal Seminar & Town Hall" hosted by Tonya Jones, Harris County Criminal Court 15 Candidate. February 17, 2018: Attorney Tatiauna Holland discussing the intersection of immigration law and criminal law issues at the Conversation With the Candidate: Legal Seminar & Town Hall at Van Fleet Greater New Baptist Church in Houston, Texas. the serious consequences of drug convictions--even misdemeanor offenses. 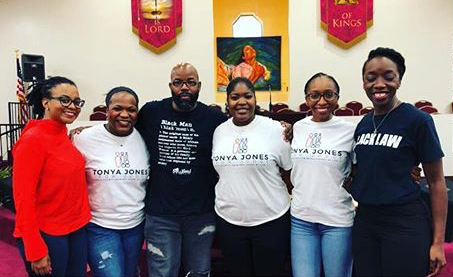 On behalf of Tatiauna Holland and the Holland Law Firm, PLLC, we would like to extend a huge thanks to Tonya Jones and her campaign for allowing us to participate in an enriching, successful community event. The Holland Law Firm, PLLC is a boutique immigration law firm located in the Greenspoint Area of Houston, Texas. We have years of experience representing clients in a variety of immigration issues, including deportation defense or removal defense, asylum law, deferred action for childhood arrivals (DACA), green cards and permanent residence, U.S. citizenship, and more. Contact the Holland Law Firm, PLLC at (832) 328-7877 or submit an online form with any of your immigration questions.